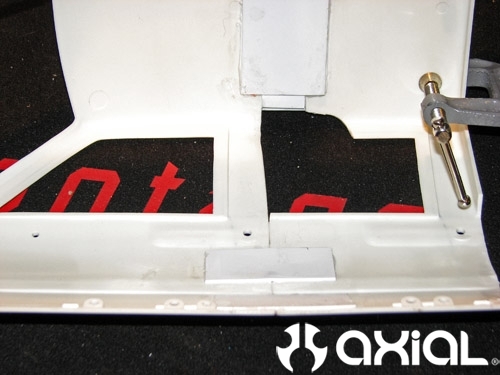 Here is a quick How-To, on installing the Axial Light Buckets on a lexan body. Once you have a good idea of where you want to install the light buckets. Take a body reamer and make two starting holes. Make sure you don’t go over, the light buckets do have a small lip on them so you have some space. Just take your time and slowly open up the holes to size. Next I took my Exacto blade and removed the remaining material. The Axial Light Buckets are very easy to install and give a really clean finished look. Then lastly, pop on the lens. I used yellow for the side marker. 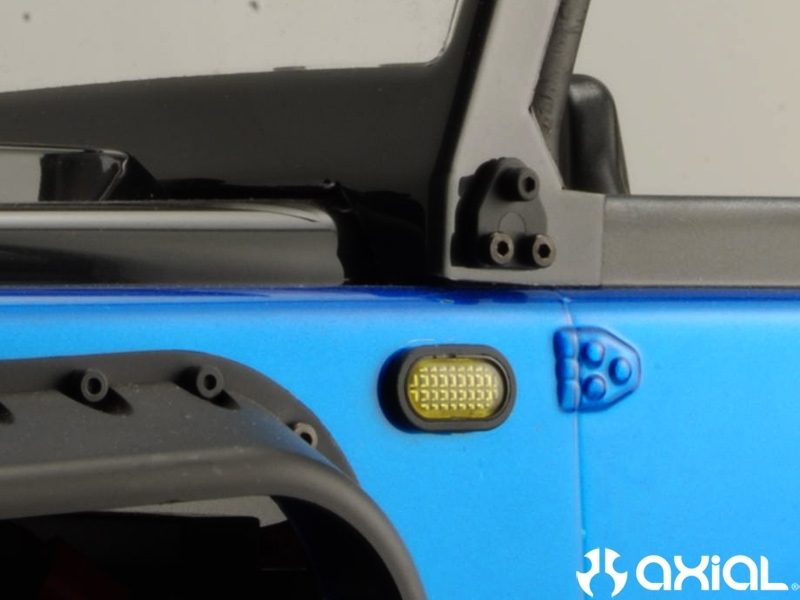 Axial has just stepped it up again with the recent release of the new Axial Trail Honcho kit, along with the scale accessories that are included and sold separately. I could not wait to get a set of the new light buckets and the Tubular style front bumper included with the Honcho kit for my SCX10 TR. 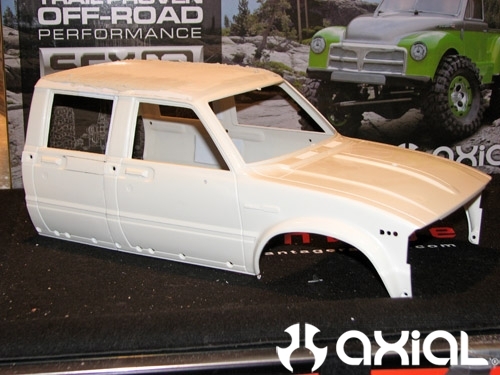 First thing I did was pick up a new unpainted Dingo body (AX4010R) and laid down a two tone paint scheme to freshen it up and give the TR a new look. I also made myself a light bar for the top of the cage from some steel plate and 1/8″ solid rod brazed together. With room for 6 of the large lights on top I used two of the Black Axial light bucket sets in addition to the two lights that were on the TR bumper. This required 3 of the Axial LED Lens sets to fill all 6 lights. Installing the Tube bumper was easy, just pulled out the 2 set screws from the original TR bumper and slid in the Tube bumper, then reinstalled the set screws. I decided to run a winch on this rig, so I cut a slot in the center aluminum bumper plate for the fair-lead to come through. To make sure I got the most use out of the light kits I installed side markers (with the yellow lenses), tail lights, reverse lights, and the smaller buckets on the tube bumper. This left a few other light buckets that I am planning on mounting to the frame for rock lights. I hope this helps show the wide range of uses for these new lights! I am loving this new look on the SCX10 TR. When Axial released their SCX10 kit, I knew I had to have one. It has an awesome realistic C channeled frame that reminds me of the old Tamiya Bruiser frame, and had awesome 1.9 bead locks and proline flat iron tires. At the time of their kit being released, I had so many projects going on that I didn’t have the chance to pick one up. With the winter upon me here in NY, the temps have dropped and its back into the shop for a winter of pure building. I picked up a kit and started thinking what I wanted to build. Since I am huge Toyota fan, work as a tech at a dealer, and own 2 1:1 trucks (an 02 Taco on 35s, and 86 4runner soon to be SAS) I knew I wanted to build another Toyota. Only problem with building another Yota is that there are tons of them out there, so I knew I needed to build something that hasn’t been done yet. I started looking around my shop at previous and on going builds… Drop bed…been done, Half doors…been done, Missing fender…been done too. Finally the gears started turning and it hit me…a 4 door Hilux would be awesome! There are only 2 or 3 that I know of on the web so I figured why not. I have never tried any sort of 4 door build myself so I figured not only would it be cool but it would be something to challenge me to step up my game. I grabbed 2 NIB Hilux cabs off the shelf, grabbed the masking tape and fired up the Dremel. 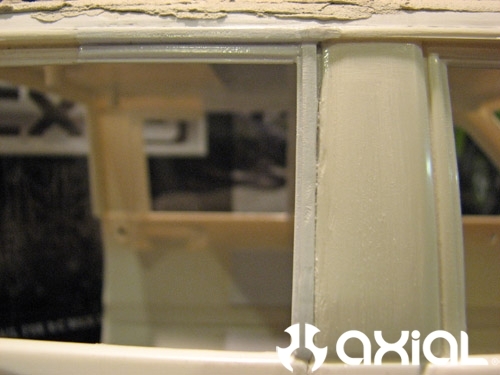 I carefully cut the 2nd cab in less then half and cut the rear window section of the 1st cab .After that, I joined the 2 cabs together using .030 styrene on the side of the door areas of the cabs and the underside of the roofs as well. When building scale RC Crawlers I always find it best to use the least amount of body filler as possible. In the past I have found that 2 much filler tends to crack easier and the weight will actually start to add up quickly. In order to avoid the roof being full of filler I decided to skin the roof using .030 piece of plastic styrene on the top and .010 on the sides. Well that is it for now, please be sure to check back often for more updates on the 4 door lux. 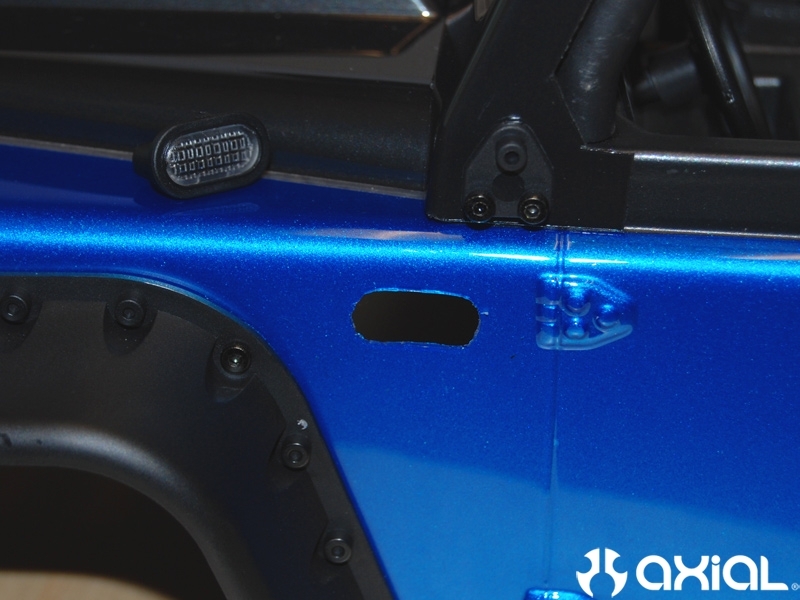 Even though the SCX10 TR’s plastic suspension and steering links are very durable, we have had a handful of requests sent to us wondering what it takes to swap out the plastic links on a TR to aluminum for even more strength. 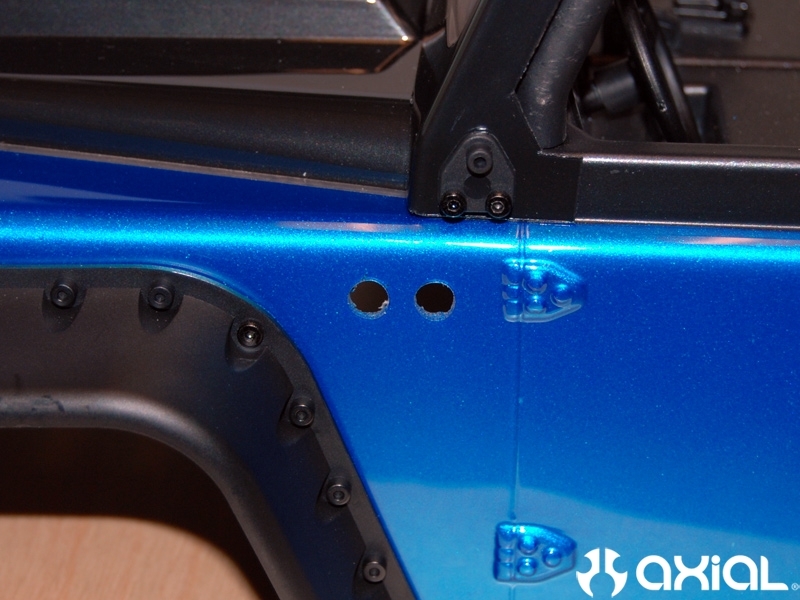 I’ve also been seeing a few questions posted by people wondering if the 4 link truss will work on the front axle of the SCX10 with the steering servo in the stock location. The answer is “yes” it will fit. 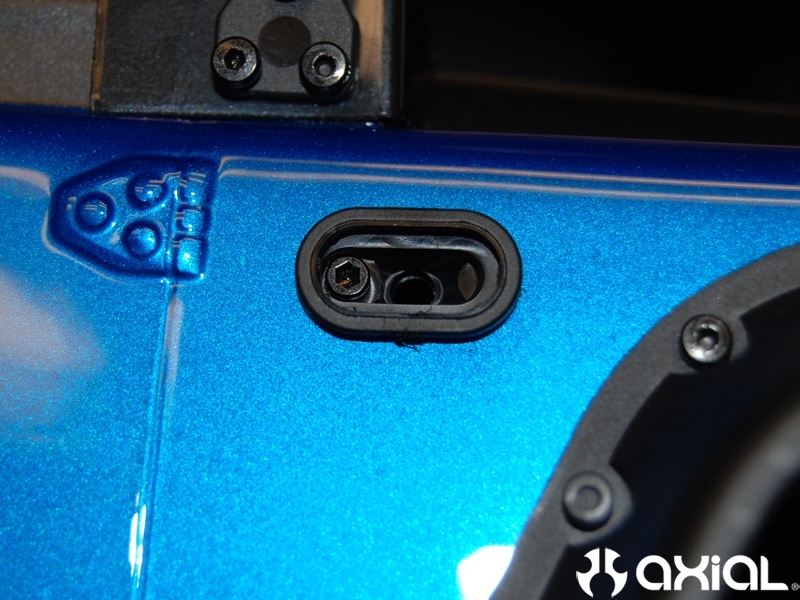 The conversion is fairly straight forward with the right parts. So, I converted my TR over to all aluminum using Axial’s scale 4 link truss front and rear to see exactly what existing Axial parts were needed to get the job done. Here is a quick breakdown of the parts I used for this conversion. 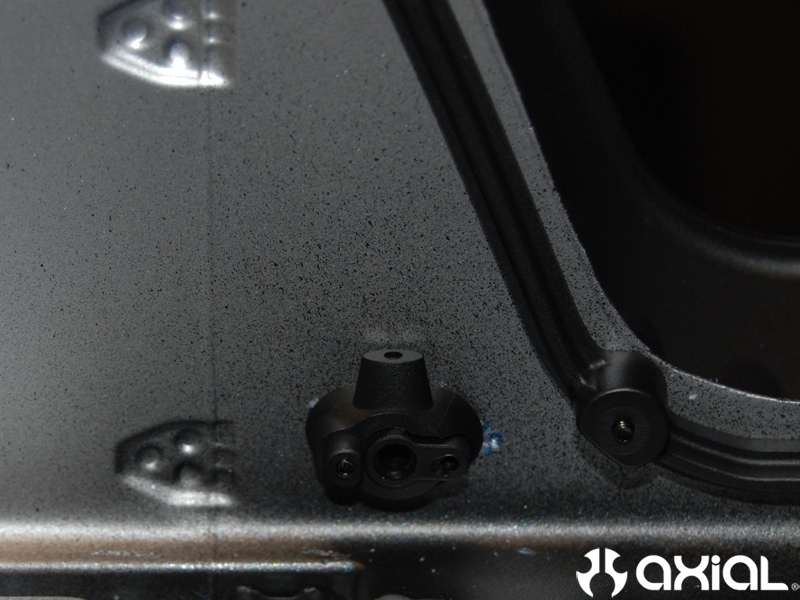 Use these parts to convert your TR to aluminum using the stock 3 link set-up. Use these parts in addition to the list above to convert your TR to aluminum using the 4 link truss front and rear. Here’s a few finished pictures. 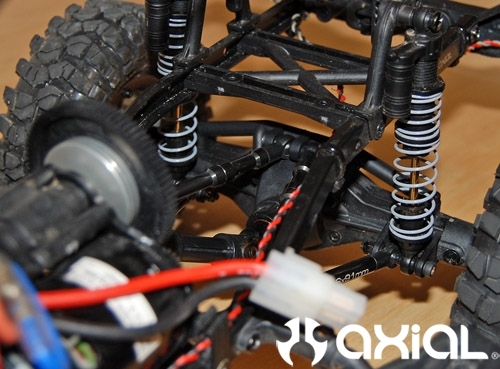 Here you can see the 4 link truss fits perfectly with the servo in the stock location on the axle. 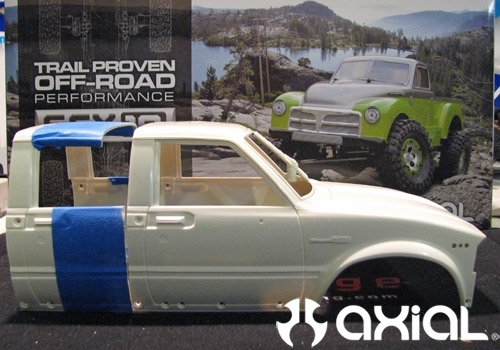 Axial SCX10 Facebook Mini Prize Give-Away! This Prize Give-Away is officially over! First and foremost, we’d like to thank everybody who signed up for our contest. If you didn’t win or aren’t apart of Facebook don’t be discouraged. We’ll be giving out additional prizes throughout the year. Please stay tuned! 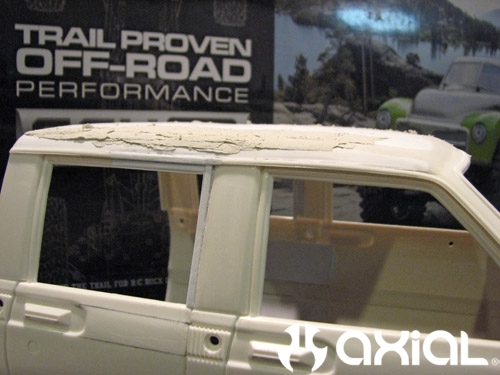 Here at Axial, we’re avid enthusiasts of off-roading and RC in general, so it makes everything that much better when we’re able to launch products that you’ll enjoy and love. Just recently we’ve received a tremendous amount of praise and response for the SCX10 product line, so we would like to show our thanks and appreciation by giving a little back. How? By giving back to all of you that have supported Axial since day one. 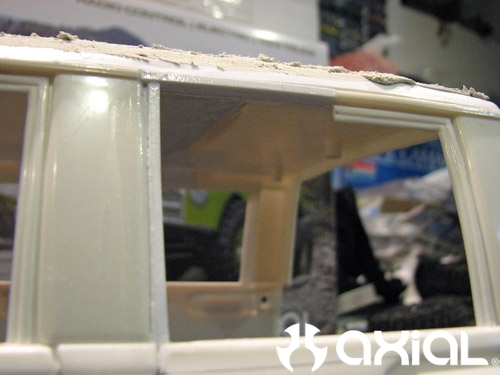 This month we’ll randomly choose an Axial friend on Facebook to win one of three SCX10′s. What better way to kick off the holidays. 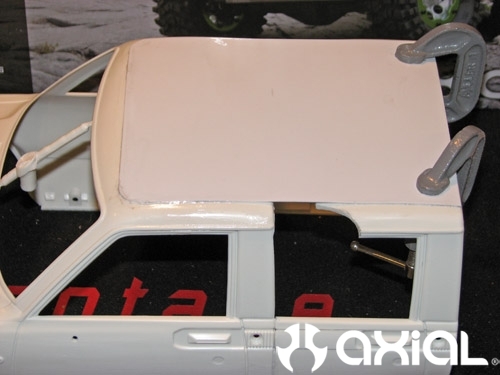 Enter Axial’s SCX10 Facebook Mini Prize Give-Away to win a brand new SCX10 Kit with Trail Honcho Body and other SCX10 products weeks before Christmas! Talk about easy. 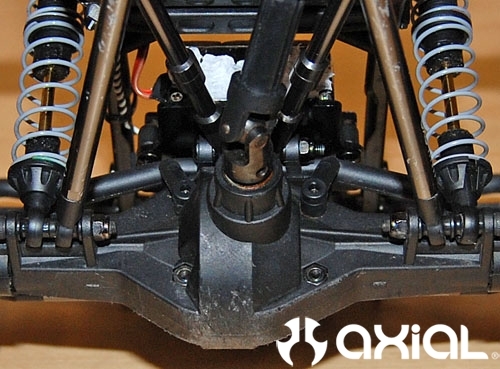 Just become a friend of Axial on Facebook! Those that are not a friend of Axial will NOT be eligible to win. Hobby shops that have an account on Facebook and are a friend of Axial are also eligible. It’s as simple as that. Click here to go to our Facebook page. Axial will choose at random three people from our friends page with the exclusion of Axial employees. 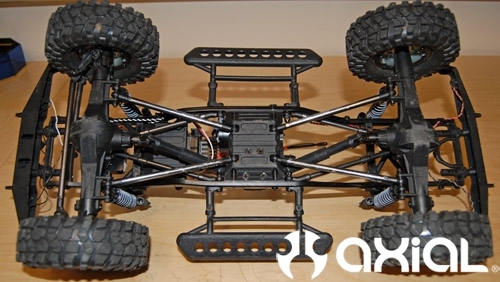 You have until Sunday, Dec. 13th at 11:59 p.m. to become a friend of Axial (if you aren’t already) for this contest. If you’re already a friend of Axial, you are automatically eligible to win any of the 3 prizes available. Winners will be chosen and announced Monday, Dec. 14 by 5:30 p.m. PST. Good luck and thank you for your support. Now go hit the trail. 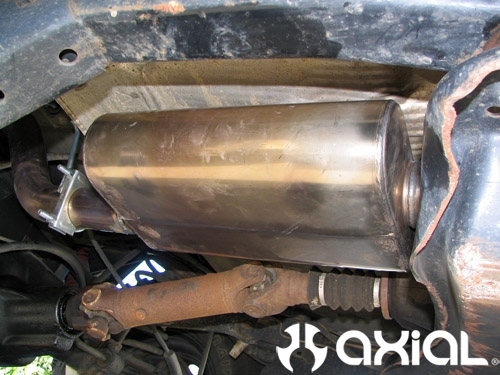 Well, I finally got a chance to have the new exhaust installed on the Jeep. As I mentioned in my earlier post, I am in the process of switching out from Colorado plates to California license plates. 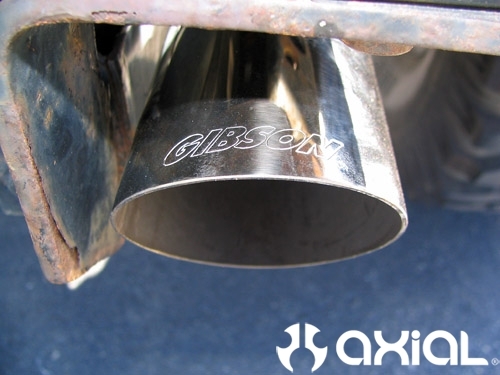 My old exhaust was pretty much beat, and I knew it wouldn’t pass the smog tests here in Cali. So, I bought a stainless steel header and stainless cat back exhaust from Gibson. I plan on keeping this Jeep and turning it into a full on trail rig at some point, and I wanted the exhaust to last as long as possible. I was looking for a 50 state legal converter for it, but couldn’t really find what I needed. So, I had the shop pull the old exhaust off and tell me how the stock converter looked. They called back a short while later and said my old stock converter looked to be in good working order, so we kept it in place. 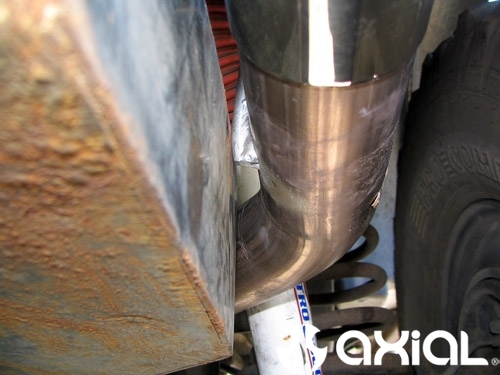 The shop, Orange County Muffler (1601 Placentia Ave, Costa Mesa, CA) for those in SoCal, installed the new headers, new 2 1/2″ stainless down pipe, welded that to my stock converter, then installed the muffler and tailpipe. I’ve had the exhaust installed for about a week now and I couldn’t be happier. 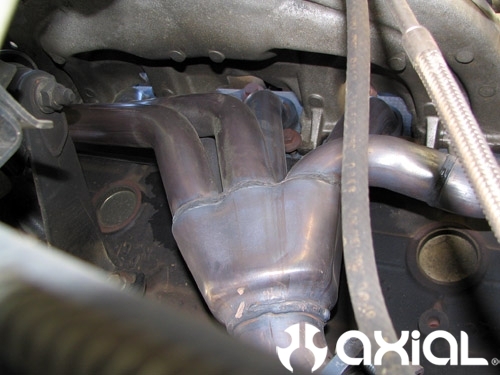 No more leaky header noise or fumes, better throttle response and way better sound. I have to give a big shout out to Gibson and their products, so far I am very impressed. Here’s a few pics of the finished system. There are a couple issues I need to iron out on the tailpipe though. 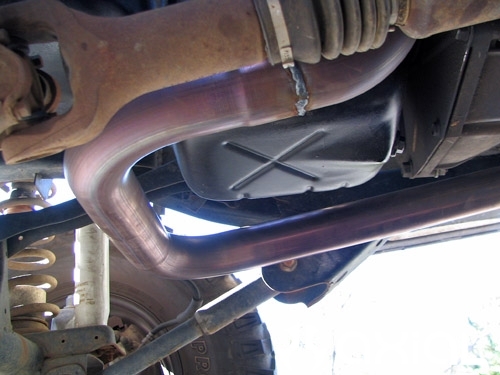 I installed a gas tank skid plate from Tomken years ago and it takes up more room than the gas tank alone, which leaves less space for the tailpipe to exit cleanly. 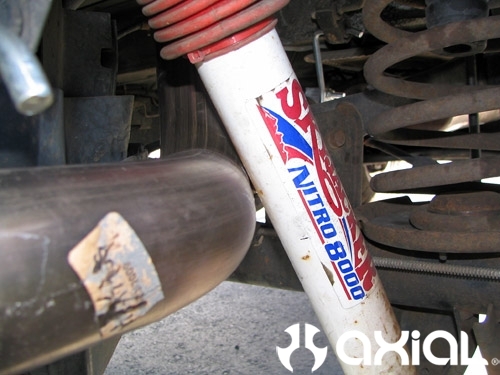 Then, with most lifted TJ’s, the longer shocks will hit the lower coil spring perches when the shocks droop out, thus damaging the shock bodies. You can fix this 2 ways, buy lower shock relocators/extenders to move the lower shock mounts away from the spring perches, like I did. 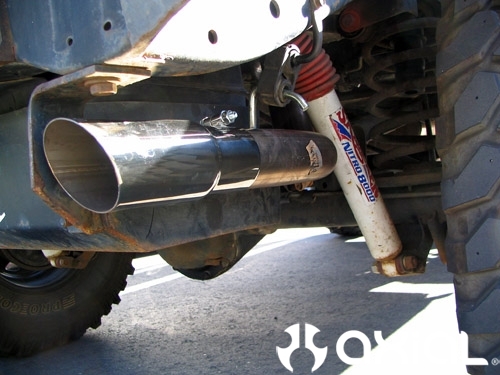 Which will leave you with even less room to work with for the tailpipe to exit. 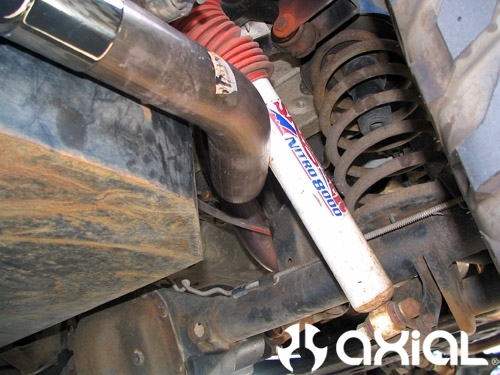 Or, I believe, you can flip the shocks upside down so the shock shaft is on the bottom, which gives you more room for the tailpipe and allows you to remove the lower shock bracket/extenders. I will probably go the latter route and ditch the extenders. Just like a custom R/C build, there is always something. Here you can see how tight the fit is right now around the shock body and gas tank skid. Sweetness, I haven’t even turned the stereo on in my Jeep since the install. Got to love that sound. Axial’s Paul Coleman Places Top Qualifier at the 2009 6th Annual Ron Paris Memorial in Las Vegas, NV! Winning Top Qualifier is nothing new for Paul especially with an Axial .28 RR-2 Engine!